As we face multiple global ecological crises, magnified by climate change, it is puzzling, even frightening, to see opposition to one of the major and already functioning forms of renewable energy, especially from the marine resources community. One would think that this community was completely ignorant of the proven threats of oil tankers to our fisheries and estuaries, or of the overfishing of food fish, or the destruction of coastal estuaries, the fish breeding grounds, for condominiums, hotels, resorts and other incompatible uses, or the polluting runoff from farms, sewers, cesspools and industry. The commercial fishing community has long sat on the sidelines as environmentalists fought the good fight to preserve ocean life. At times they attacked them and federal scientists, claiming that they knew better than the experts about the “real” condition of fisheries. And now once again, they are in denial about the imperative of moving to wind power and solar energy as rapidly as possible. They are misguided and misinformed, and scarcely better than the climate deniers themselves. 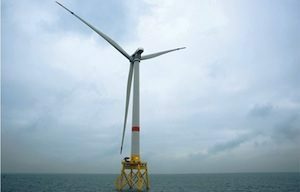 The offshore wind farm, and future ones like it, must not be defeated by those whose understanding of the climate crisis is minuscule and who opposition has no scientific or public policy basis. Ms. Salzman was a Suffolk County Green Party candidate for congress in the 1st CD in 2002 and sought the U.S. Green Party presidential nomination in 2004. She was a cofounder of the Shoreham Opponents Coalition. Ms. Salzman, you are clueless. And for that reason I am not surprised you feel as if you are qualified to not only preach your opinions. I see most folks such as yourself know what’s best for all of us. And you feel you are qualified to lead our nation? Thank God the masses have yet to be indoctrinated to this foolishness. I have great respect for many of the people who have earned their living off the water, but when I see a comment like this, I have to concede that my faith in their (and our) future falters. Opinions should be based on facts, not mere bias. This gentleman needs to remain silent, rather then make himself look so foolish by slinging groundless negative and demeaning personal comments at someone who has spent her entire life studying these and other critical environmental issues. And Ms Salzman is right on point when she expresses her surprise and dismay about the opposition to offshore wind power that has developed. If they think nuclear and fossil fuel is a better option, why there are plenty of well established facts available to refute this position. We need to support solar power in all of it’s alternative forms if we are to even come close to meeting our future needs. Mr. Wilson, I would venture to say that you are not involved in a business that has not been under attack by the so called environmentalist community who use false claims and innuendo. Not to mention a tyrannical government agency that has been infiltrated by these same people. Bias? Facts? Hah, facts mean nothing to those in power and those who are on a mission to destroy an iconic industry for their own self gain while selling a bill of goods to an all to eager uninformed citizenry. You would rather silence me. This does not surprise me at all. You say I make myself look foolish?Speak with anyone who works on the water for a living who have been marginalized for decades and told they must sacrifice in order to save themselves. Told by so called experts who have no practical knowledge but rather have gone to learn everything from a book and because they have a title attached to their names they know what’s best. Now their told they must give up more? Possibly give up enough ground to completely wipe out everything they’ve worked their entire lives for? They would agree with everything I say. This is unproven technology that has destroyed many fishermen in Europe who have gotten in their way. Now you want me to remain silent while the same thing could possibly happen here? If you feel I was demeaning you have no idea how difficult it is to temper what I really want to say about these experts, not to mention it wouldn’t be printed. I’ve been dealing with these experts for 40 years and all they do is bring hardship and pain while making groundless claims to justify their existence while they look down their noses at those who deal with things hands on daily who truly know what’s going on. I’ve seen enough to know who should be trusted. Those who would seek gain at the expense of others are not on my most trusted list. in rants against “elitism”, meaning all who have an education, literacy and a functioning brain. was vulnerable from the beginning because science research and education was in its infancy. The debate over Darwin and evolution was a natural target for irrational beliefs and ideology, as witness the Scopes trial in the early 20th century. But even after that. science denialism flourished as religious fundamentalists took aim without cease at school curricula, demanding the inclusion of creationism and later “Intelligent design” on an equal footing. serious synthesis of evolution and social behavior. connection between evolution, human behavior and society.